Nowhere can be found in anything – a crowd, a composition, or a state of mind. 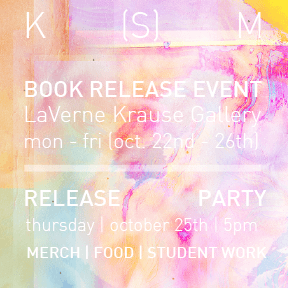 Join Kitchen Sync magazine to celebrate the conclusion of Issue 01: The Middle of Nowhere on Thursday, October 25th at 5pm in the Laverne Krause Gallery! There will be free food and stickers, as well as t-shirts and copies of our first print issue for sale. Swing by and tell us what you want to see in our next issue! Kitchen Sync Magazine is a student-run, interdisciplinary, creative publication in the University of Oregon’s College of Design. Our goal is to create a dynamic platform for the cultivation of identity and foster an exchange of ideas between students of all disciplines within the College. This dialogue is documented through a curated display of students’ creative and intellectual work, presented alongside that of professionals and academics.